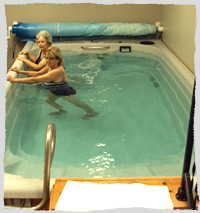 Aquatic Therapy is a rehabilitation procedure done in a heated pool. Exercise instructions are given by a licensed physical therapist who is trained in aquatic therapy. Water provides an environment which minimizes stress to the back and weight bearing joints. Weight bearing can begin earlier in water and it also provides resistance through range of motion to increase strength and core stability. Hydrostatic pressure can reduce swelling. Water also challenges your balance and enables a normal walking pattern. One benefit of aquatic therapy is the buoyancy provided by the water. While submerged in water, buoyancy assists in supporting the weight of the patient. This decreases the amount of weight bearing which reduces the force of stress placed on the joints. This aspect of aquatic therapy is especially useful for patients with arthritis, healing fractured bones, or who are overweight. By decreasing the amount of joint stress it is easier and less painful to perform exercises. The viscosity of water provides an excellent source of resistance that can be easily incorporated into an aquatic therapy exercise program. This resistance allows for muscle strengthening without the need of weights. Using resistance coupled with the water’s buoyancy allows a person to strengthen muscle groups with decreased joint stress that can not be experienced on land. Aquatic therapy also utilizes hydrostatic pressure to decrease swelling and improve joint position awareness. The hydrostatic pressure produces forces perpendicular to the body’s surface. This pressure provides joint positional awareness to the patient. As a result, patient proprioception is improved. This is important for patients who have experienced joint sprains, as when ligaments are torn, and proprioception becomes decreased. The hydrostatic pressure also assists in decreasing joint and soft tissue swelling that results after injury or with arthritic disorders. ​Lastly, the warmth of the water experience during aquatic therapy assists in relaxing muscles and vasodilates vessels, increasing blood flow to injured areas. Patients with muscle spasms, back pain, and fibromyalgia find this aspect of aquatic therapy especially therapeutic. People with acute/chronic pain, arthritis, joint replacements, fractures, fibromyalgia, sports injuries, neck/back pain, stroke, sprains, and strains, etc. Monday - Friday 9:00 AM to 5:00 PM • Extended hours are available!